See Part 1 of the Television Pilot (Battle at the Bottom of the World! 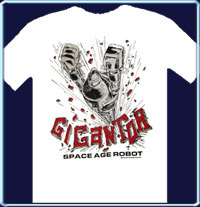 - made in 1965)- the Pilot that launched the world's Mightiest Giant Robot! 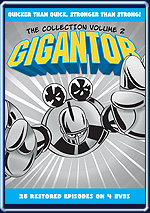 --Gigantor! THE ORIGINAL GIGANTOR was "born" in New York City during the summer of 1963. 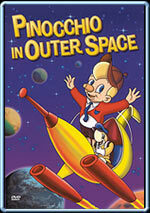 That is when Fred Ladd first saw artwork of a giant, needle-nosed robot remotely controlled by a young boy. 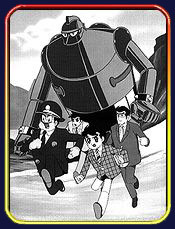 The artwork had been created in Japan some 7 years earlier by Tokyo-based artist Mitsuteru Yokoyama; the adventures of the robot (in Japanese, "Tetsujin 28," translated as "IronMan 28") had appeared in a boys' magazine (Shonen) and were successful enough to generate a black-and-white animated TV Series called "Tetsujin 28-Go". 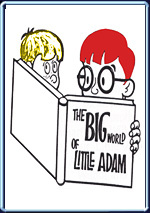 Ladd, then working simultaneously on an animated feature called "Pinocchio In Outer Space," on animated TV series "The Big World of Little Adam," and on the Japanese animated TV series "AstroBoy," was immediately intrigued by the notion of an empowered youngster controlling an enormous robot. With his late partner Al Singer, Ladd formed a corporation called Delphi Associates, Inc., specifically to acquire and produce, in English, fifty-two episodes, each approximately thirty minutes in length, which would be called "Gigantor." 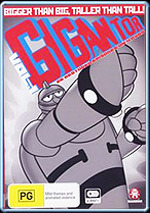 Ladd re-named the robot "Gigantor"; the 12-year old boy who controlled the robot became "Jimmy Sparks"; Jimmy's guardian and mentor, Dr. Shikishima, emerged as "Doctor Bob Brilliant"; and the robot's mission became a crusade against crime. In this pursuit, Jimmy worked hand in hand with oft-inept detective chief inspector Otsuka, known in English as Inspector Ignatz J. Blooper. 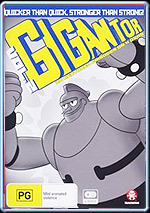 A theme song, "Gigantor!" 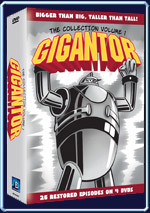 was composed for the fifty-two programs, and "Gigantor," the series, became a reality in 1964, appearing throughout the late 1960s on television stations in the U.S.A. and abroad. 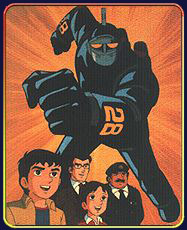 In 1993, Ladd and Tokyo-based TMS animation studio joined forces to convert TMS' 51-episode color series of 'Shin Tetsujin 28' to "The New Adventures of Gigantor." 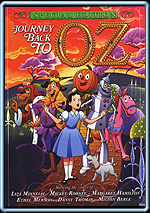 Character designs are based upon the same drawings seen earlier in the b/w series, but are more sleek, more modern. 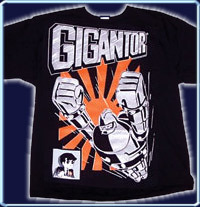 Gigantor and Jimmy Sparks new Black T-Shirt. For more about Fred Ladd's impact on anime, read "Astro Boy and Anime Come To The Americas: An Insider's View..." from McFarland and Company, Inc.
"The Space Explorers" and "The New Adventures of the Space Explorers"